The play that LVC’s Wig & Buckle Theater Company is offering for you tonight is a most unusual choice. Following on the heels of last year’s English 204/ Wig and Buckle joint production of Katie McCarty’s I Think You Should…and this November’s Playwrights’ Alliance of Pennsylvania/ Wig and Buckle production of the late Art Litoff’s Which Ending Would You Choose?, Leedy Theater is, for the third time in 18 months, the venue for the world premiere of a new work, yet tonight the new work itself is in reality a play that is itself over 100 years old—Frank Wedekind’s controversial story of adolescent angst and social repression, Spring Awakening. So, how can a play that’s 100+ years old be a new work? Simple—a very dedicated young LVC scholar, senior German major Stephanie Henrich (who is also The Wig & Buckle Company’s president and the student director of this production) has made a brand-new adaptive translation of Wedekind’s play just for us, and we are honored to give this translation its first performance anywhere. The play’s author, Benjamin Franklin Wedekind (“Frank” for short), was born in Hanover, in an as-yet-ununified northern Germany in 1864; the son of a German doctor and a Hungarian-born German-speaking actress who had met and married while emigrants in San Francisco, Wedekind had received his birth name thanks to his father’s commitment to the democratic revolution of 1848-49 in which the elder Wedekind had participated against the oppressive forces monarchical reaction, who were bent on unifying Germany under the autocratic military rule of Prussia. Frank spent his formative years in the German-speaking cantons of neutral Switzerland, where his father settled on his return from America rather than live under the policies of the antidemocratic Prussian chancellor Otto von Bismarck. Young Wedekind must’ve absorbed his parents’ antiestablishment outlook, for before long he was embarking on a colorful vagabond career as a cabaret performer, actor, secretary to a circus, adman for a Swiss soup company, and satirical poet and essayist for a political humor magazine. This last role led to a period of exile and a six months’ stretch in a fortress prison in 1899 for making fun of the meglomaniacal German emperor Wilhelm II’s state visit to the Holy Land. During this peripatetic period of his life, Wedekind espoused a personal philosophy that ran completely at odds with the starch-collared repressiveness of the Wilhelmine German Empire, a belief that the sexual impulse was the central driving force in huma n behavior; this philosophy led Wedekind to start work on his most famous work, Spring Awakening, sometime in 1891. The play didn’t get onstage until 1906, when legendary Berlin theater impresario Max Reinhart produced it—the play was denounced nationwide as an immoral attack on family and state values, and disappeared from German stages until the freewheeling amorality of post-WWI Weimar Germany made Wedekind (who had diedin 1918 from acute appendicitis) a cultural hero among the avant-garde artists challenging the rise of Fascism. Naturally enough, the rise of Hitler and Nazism doomed Wedekind’s works to another period of complete censorship in his native land, but the advocates of two emergent schools of European playwriting, Epic Theatre and Expressionism, hailed Wedekind’s theatrical experiments as the inspiration for their own bold attacks on the malignant dictatorship which overwhelmed their more docile countrymen. Spring Awakening has since become Wedekind’s most-produced play, even serving as the basis for a recent hit Broadway musical. s The three young people at the center of Wedekind’s play carry burdens all too familiar to today’s teenagers— wilting under pressures to achieve and succeed in school and society, suffering from a lack of frank communications with their conservatively repressed or liberally permissive parents about the realities of their emerging adolescent sexuality, exploring feelings no one in authority seems willing to even mention, let alone discuss, confronting life-or-death choices without proper guidance. 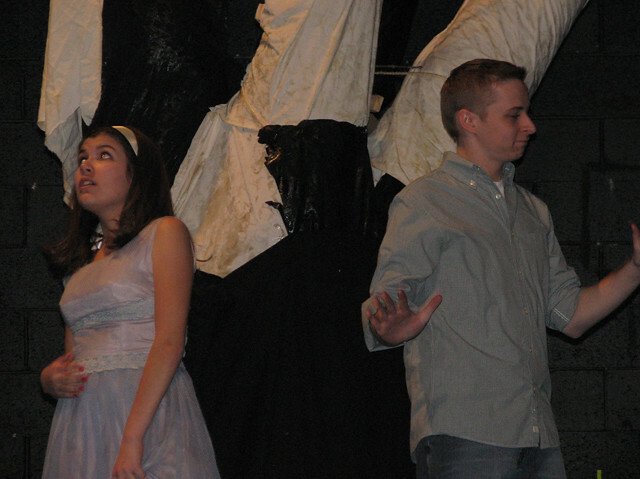 Those who object to the alleged immorality of Wedekind’s portrayal of teenage longings often overlook the fact that Moritz, Melchior, and Wendla suffer the full consequences of their choices—no “helicopter parents” here to bail them out, no second chances to suspend the rules that an uncommunicative and repressive society demands they live by. 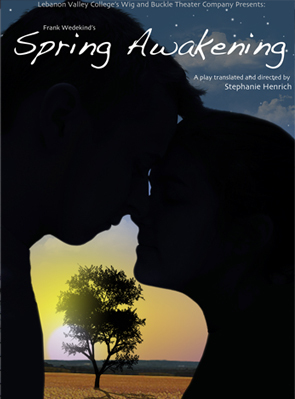 Stephanie Henrich has set this adaptation in a vaguely 1950s-style private school in postwar Europe, but her translation stresses, as Wedekind’s original does, the universal nature of the challenge that all young people face—how do you discover who you are and how you feel and get out of the process alive? The students of the Wig & Buckle Theater Company have had to face many challenges of their own in developing this new translation for the stage—there have been endless rewrites, test readings, dramaturgical consults, language accuracy checks, nuances to capture and new acting techniques to master. We hope that you see in all this hard work the true value of the collaborative theatrical experience in a liberal arts college environment—it is this kind of learning put to direct use, the combination of studies in stagecraft, history, foreign languages, performance studies, and literature, that is what our mission at LVC is all about—equipping our young people to survive and thrive in a changing world. Thanks for you patronage.